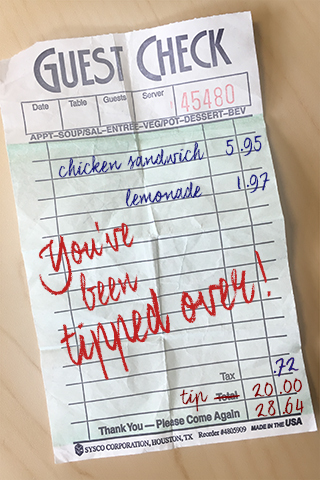 That person you waited on felt God nudge them to leave a larger-than-usual tip. You’re an important part of this community. You make life a little better and a little brighter for the people you serve every day. And while you probably run across the occasional “hard to please” customer, your service IS appreciated. Thank you for doing what you do! Hope being “Tipped Over” brightened your day a bit! Surprised by a larger-than-usual tip? How’d it feel when you were TIPPED OVER? It’s simple. Just look for any opportunity to show love to those who serve us! "You've been tipped over! Check out beentippedover.com"
When we serve or give just to make someone’s life a little better – with no agenda but authentic love – the heart of Jesus is expressed. THANKS FOR HELPING SHARE THE LOVE!